The family of Troy Anderson and council person Angel Fuentes pictured at Camden city hall on Thursday March 21, 2019. The group discussed possible solutions to Fuentes' ordinance to regulate makeshift memorials. A Camden City Council meeting to gather input from the public on a law that would limit how long makeshift memorials could be displayed came and went Thursday with only one family testifying and no indication of how the proposal would fare. Last month, Councilman Angel Fuentes introduced the ordinance, which would cap at 15 the number of days makeshift memorials could stand before having to be taken down. His proposal, however, was met with some resistance from community members who said it was inconsiderate to families who had just lost a loved one. Earlier this month, Council put off acting on the law and scheduled Thursday’s meeting to hear more from residents. On Thursday, before a largely empty City Council chamber, the family of Troy Anderson, a 15-year-old who was shot and killed in 2014, spoke of the pain they would have felt had they been forced to take down their memorial after 15 days — as Fuentes’ proposal would mandate. Nereida (left) and Angel Lamberty (center) listen to council person Angel Fuentes (right) as he offers alternative solutions to his ordinance on Thursday March 21, 2019 at Camden city hall. The hearing ended with Fuentes saying he will continue discussions with community members, particularly Nyzia Easterling, an activist who has spoken against the proposal. Easterling’s nonprofit, Saving Grace Ministry, assists children of Camden who have lost a parent to violence. She was unable to attend Thursday night’s meeting. Since Council took no action on the ordinance during last week’s meeting, Fuentes said he would have to introduce a new ordinance. Anderson’s murder, which is unsolved, caused the family intense pain, Lamberty said in an interview. She said she would have been devastated if she had been forced to remove the memorial. It is now a three-square-foot garden that displays flowers, figurines, and a photo of her grandson. 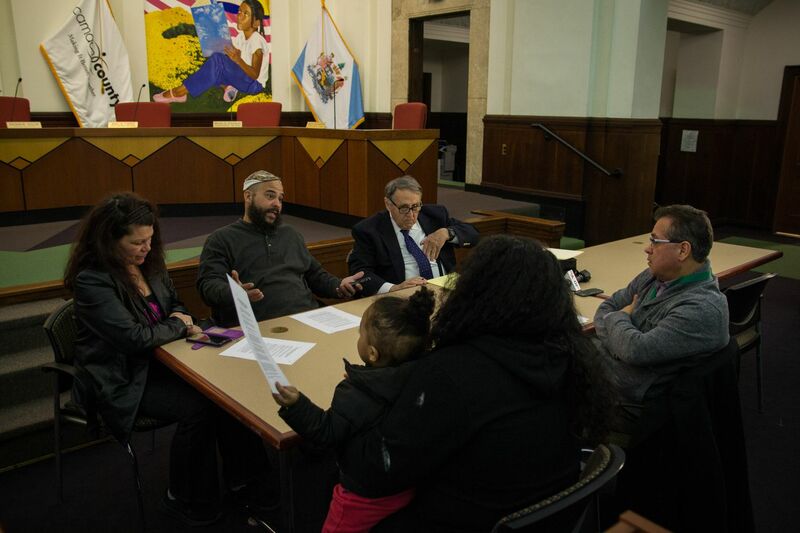 The family of Troy Anderson and council person Angel Fuentes discuss possible solutions to his ordinance during a public meeting on Thursday March 21, 2019 at Camden city hall. Lamberty’s husband, Angel, said the location of the memorial was where Anderson died. It is across the street from the church where he and his sister were baptized. To the family, this “sanctuary is 100 times better” than visiting his grave, said Angel Lamberty. One alternative that has been suggested is a wall commemorating the victims of violence. Families of loved ones could place a plaque that would memorialize their family member, said Fuentes, who said he supports such a wall. This would do away with having memorials scattered throughout the city. The victims are often killed in front of properties that are not owned by their families. Fuentes said he has heard from residents who said they are fearful of retaliation from victims’ families if they try to remove the memorials. Council person Angel Fuentes (right) speaking with the family of Troy Anderson at a public meeting to discuss his ordinance on regulating makeshift memorials on Thursday March 21, 2019. Fuentes also proposed asking neighbors for permission to erect memorials in locations associated with lost loved ones. If memorials are proved to be well-maintained and cleaned, then with permission, they could stay put. If not properly maintained after two weeks, the memorial would be subject to removal. “Even though we can’t find the murderer, it doesn’t matter. This person still exists,” Angel Lamberty said. Troy Anderson’s memorial is at Congress and Yorkship Roads in the Fairview section of Camden. His family pays tribute there every April 24, the anniversary of his slaying. Gloria Medina (center) listens as council person Angel Fuentes (left) offers alternative solutions to his ordinance on Thursday March 21, 2019 at Camden city hall.